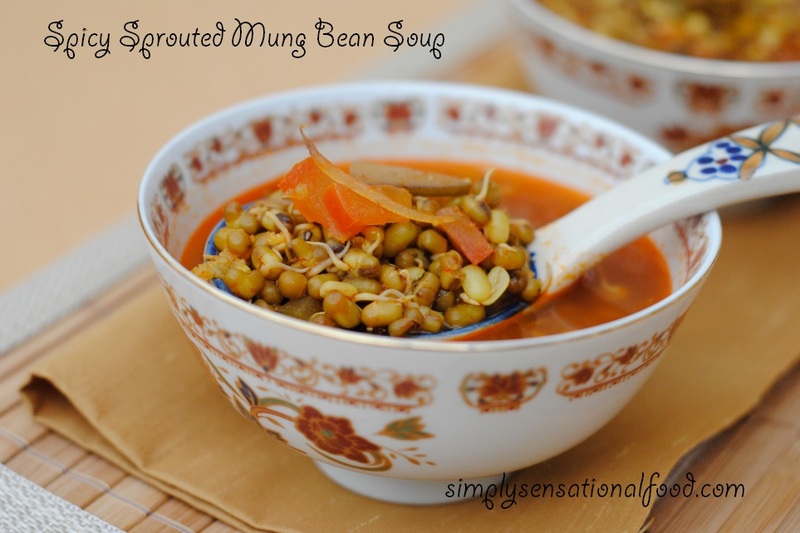 Protein packed hot and spicy sprouted mung bean soup. 1 teaspoon fresh ginger paste. 1.In a pan add the olive oil and when it is hot add the garlic and onions and sauté until pink and translucent. 2.Add the sprouted mung beans, garlic paste, pasatta, salt and simmer the soup for 10 minutes until mung beans are tender. 3. Add the soya sauce and garlic chilli sauce and the chopped tomatoes.Simmer for 2-3 minutes and turn off heat. 4. Transfer the soup to serving bowls and serve hot. Lets cook with pulses event by simplyfood. Sounds like a great store-cupboard soup - I've got all the ingredients in the kitchen, except the mung beans! Michelle you can make it with tinned lentils too, just use those instead of mung beans. Jen you can make it with tinned aduki beans or lentils instead. This looks so good, I have to try it. It looks easy to make. Thank you for sharing. I hope you try it Tami. Oh gosh, that sounds delicious!! This looks and sounds delicious. I love your pictures, they look so professional. Thanks Fiona, I am really trying to improve my photography and appreciation from you guys gives me lots of encouragement. I've never tried mung beans, they look lovely in your soup. Love soups, the mung beans look lovely and adore garlic and chilli, so may have to try this. Don't think I've tried mung beans before. Your soup sounds delicious! I have to admit ive never tried mung beans but this soup looks lovely and vibrant and fresh i may have to give it a go! 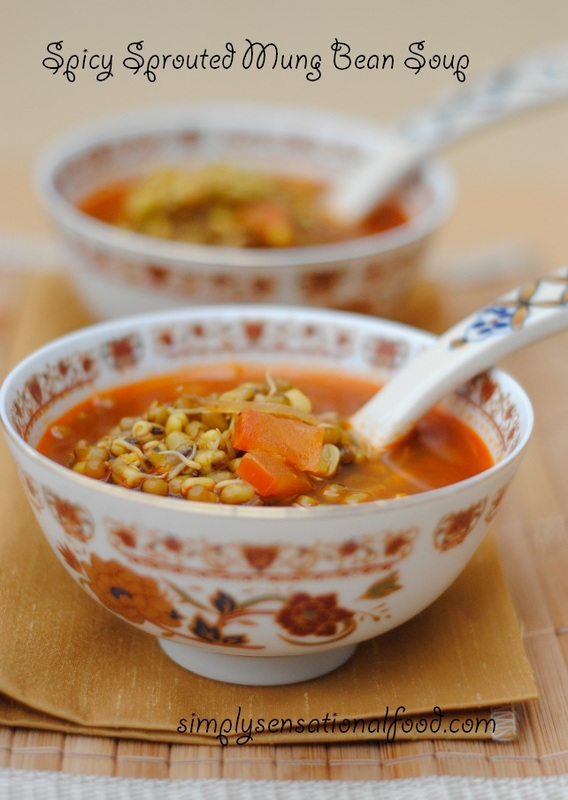 I love lentil soup and the flavours here sounds amazing. Must hunt down some mung beans! Looks like a yummy soup with some mung bean .required for this rainy weather . Yes Sathya, perfect to warm up with. I'm not sure this is my sort of thing but I am keen to learn more about sprouting. Lovely photos! Kate I guess spicy food is not everyone's cup of tea, but you can eat sprouted pulses in salads too.They are very healthy. Yum, this sounds delicious and if I went to a restaurant and it was on the menu with a photo like yours I would definitely order it! Really different and interesting! I've never thought of cooking with mung beans, interesting. Oh this looks nice and healthy! Looks yum too! Mmmm...I have wanted to have a go at sprouting for a long time myself, and this looks like a unique way of using them in something other than salads. Haven't had soup for a long time. This looks very tasty. oo that looks like just my sort of thing. As you know I have just finished a week of nothing but juice, so this is my first day back on food. I still can't face cooked food, but once I can I am definitely trying this out. Lovely to discover your blog - we are a family of vegetarians so this is great for us. That sounds delicious, your photographs really bring it to life! What a creative concept! Sounds very interesting! This looks delicious! I've never used mung beans before. Oh wow this looks fabulous! I've never made anything like this, but I think it's going to have to go onto my 'to cook' list. This recipe sounds delicious. I am really wanting to try more soups, this recipe would be the perfect start. I've never tried mung beans but looks like a super simple and tasty recipe - like the idea you can make with tinned lentils too. That sounds really heathy and looks really delicious. Wow.. hot and spicy mung bean soup is to my taste.. love spicy dishes... Now it is winter here and this is a perfect dish. Mung soup sounds so good and being sprouted, so healthy as well..very lovely pictures.. Thank you for sharing this recipe. I think my family are getting bored with my traditional recipe of making sprouted Mung beans. Now I can make a variation. Great way to use sprouted mung beans, will try this out. I made this but it was a little too hot for me but probably because I was a little too generous with the spices! Re-made with less spices and perfect! Plenty of fibre content in this soup! Great thanks!